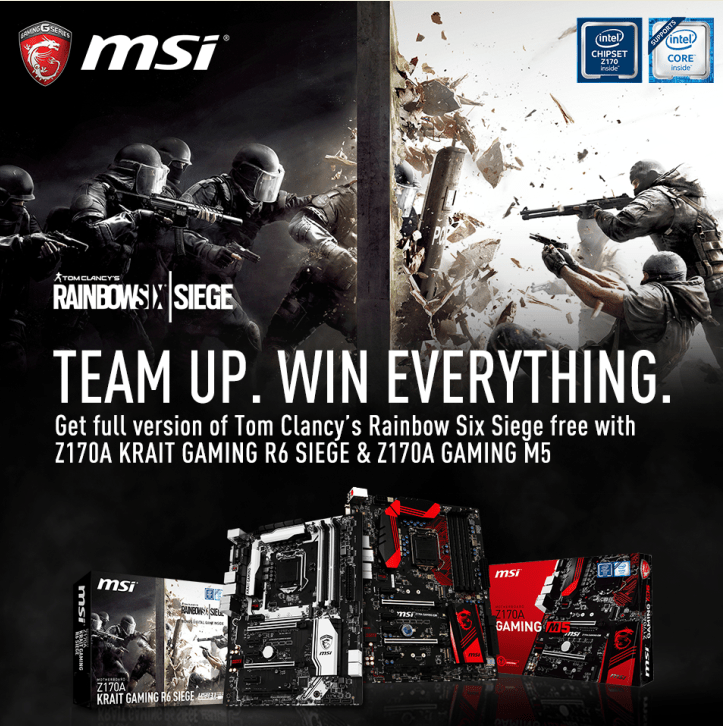 * Z170A KRAIT GAMING R6 SIEGE game bundle promotion is available worldwide. Promotion Date: December 1st 2015 to March 1st 2016 or while supplies last. The offer is valid for purchases within the promotion period. * Z170A GAMING M5 game bundle promotion is available in selected countries only. Qualifying Countries: Australia, Bangladesh, Belgium, Canada, Czech Republic, Denmark, France, Finland, Germany, India, Indonesia, Israel, Italy, Japan, Macao, Malaysia, Netherlands, Norway, Philippines, Poland, Portugal, Russia, Singapore, South Africa, Spain, Sweden, Taiwan, Thailand, Turkey, United Arab Emirates, United Kingdom, United States, Vietnam.